The White House is considering plans in hopes of reversing soaring numbers of families attempting to cross illegally into the United States. The White House is actively considering plans that could again separate parents and children at the U.S.-Mexico border, hoping to reverse soaring numbers of families attempting to cross illegally into the United States, according to several administration officials with direct knowledge of the effort. One option under consideration is for the government to detain asylum-seeking families together for up to 20 days, then give parents a choice: Stay in family detention with your child for months or years as your immigration case proceeds, or allow children to be taken to a government shelter so other relatives or guardians can seek custody. That option — called “binary choice” — is one of several under consideration amid the president’s frustration over border security. He has been unable to fulfill key promises to build a border wall and end what he calls “catch and release,” a process that began under past administrations in which most detained families are quickly freed to await immigration hearings. The number of migrant family members arrested and charged with illegally crossing the border jumped 38 percent in August, and are now at record levels, according to DHS officials. Senior administration officials say they are not planning to revive the chaotic forced separations carried out by the Trump administration in May and June that spawned an enormous political backlash and led to a court order to reunite families. But they feel compelled to do something, and officials say senior White House adviser Stephen Miller is advocating for tough measures because he believes the springtime separations worked as an effective deterrent to illegal crossings. At least 2,500 children were taken from their parents over a period of six weeks. Crossings by families declined slightly in May, June and July before surging again in August. September numbers are expected to be even higher. While some inside the White House and Department of Homeland Security are concerned about the “optics” and political blowback of renewed separations, Miller and others are determined to act, according to several officials briefed on the deliberations. There have been several high-level meetings in the White House in recent weeks about the issue. “Career law enforcement professionals in the U.S. government are working to analyze and evaluate options that would protect the American people, prevent the horrific actions of child smuggling, and stop drug cartels from pouring into our communities,” deputy White House press secretary Hogan Gidley said in an emailed statement. Any effort to expand family detentions and resume separations would face multiple logistical and legal hurdles. It would require overcoming the communication and data management failures that plagued the first effort, when Border Patrol agents, Immigration and Customs Enforcement officials and Department of Health and Human Services caseworkers struggled to keep track of separated parents and children scattered across the United States. Another hurdle is that the government does not have detention space for a large number of additional families. ICE has three “family residential centers” with a combined capacity of roughly 3,000 parents and children. With more than four times that many arriving each month, it is unclear where the government would hold all the parents who opt to remain with their children. But Trump said in his June 20 executive order halting family separations that the administration’s policy is to keep parents and children together, “including by detaining” them. In recent weeks, federal officials have taken steps to expand their ability to do that. In addition to considering “binary choice” and other options, officials have proposed new rules that would allow them to withdraw from a 1997 federal court agreement that bars ICE from keeping children in custody for more than 20 days. The rules would give ICE greater flexibility to expand family detention centers and potentially hold parents and children longer, though lawyers say this would be likely to end up in court. Officials have also imposed production quotas on immigration judges and are searching for more ways to speed up the calendar in its courts to adjudicate cases more quickly. Federal officials arguing for the tougher measures say the rising number of family crossings is a sign of asylum fraud. DHS Secretary Kirstjen Nielsen has blasted smugglers for charging migrants thousands of dollars to ferry them into the United States, knowing that “legal loopholes” will force the administration to release them pending a court hearing. Federal officials say released families are rarely deported. Advocates for immigrants counter that asylum seekers are fleeing violence and acute poverty, mainly in Central America, and deserve to have a full hearing before an immigration judge. In southern Arizona, so many families have crossed in the past 10 days that the government has been releasing them en masse to shelters and charities. A lack of available bus tickets has stranded hundreds of parents and children in Tucson, where they sleep on Red Cross cots in a church gymnasium. Nielsen said lawmakers needs to give DHS more latitude to hold families with children in detention until their cases can be fully adjudicated — a process that can take months or years because of huge court backlogs. 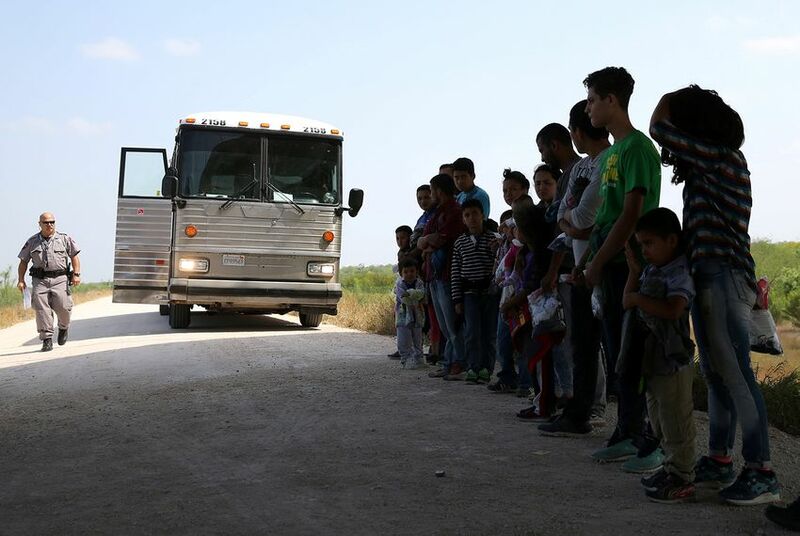 DHS officials have seen the biggest spike this year in families arriving from Guatemala, where smugglers called “coyotes” tell migrants they can avoid detention and deportation by bringing a child, according to community leaders in areas with the highest rates of emigration. “I think there’s more that we can do to hold them responsible, particularly those who traffic in children,” she said in a speech at the second Conference on Prosperity and Security in Central America. More than 90,000 adults with children were caught at the southwest border last fiscal year, which ended Sept. 30, a number that has surpassed the previous high of 77,600 in 2016.